It is a truth universally acknowledged that the sight of a grandmother running a kitchen in a restaurant brings a sense of warmth to the stomach of any man. The anticipation is further heightened in the sub-species known as the seasoned bachelor. I have seen grown men regress to their misspent and gluttonous youth, instantly shedding the heady shackles of responsibility as fond memories visibly surface. A certain look comes over the face and, for an instant, monosyllabic grunts are all that one is capable of. A food coma in prospect, the salivary glands go into overdrive. You'll notice a lot of involuntary licking of lips. If you listen closely you'll hear them whisper the adjective 'mouth-watering' under their breath. If only one could bottle up that instant cheer. I should know. Even though matrimony has been treating me well, that was me this Saturday. Food is like that. Homecooked food, made with expert care is like that. Comfort food is by definition richly valued and time-tested, and the visual cues, those Auntie or Grandma figures, are rightly emphasized in advertising. An authentic real-life grandmotherly intervention is to be prized above almost all else. And there it is, front and center, as you enter: you see her. Smiling her warm welcoming smile, she's surrounded by the pots with perhaps a ladle in hand, stirring, prodding, orchestrating a small slice of culinary nirvana. She's in full control, cooking with glee. You'll hear her dispensing pearls of wisdom, advising the others on spices and such. Still it's her show. She's a grandmother. It's her thing, she's in it for love. It's the usual story: her reputation for homecooking was outsized, it wasn't just the extended family, but also the friends, and their friends. They all knew. She liked to cook, that's all. First it was a little joint a few blocks away, not much more than a little trailer, yet it kept going for 8 years. Now there is more capital, so it's a full-blown restaurant. They've lost the training wheels as it were; the revamp and grand-opening was late last year. Moving on up like Curtis Mayfield sang. It's one of those crossroad neighbourhoods. The signs of recent gentrification are mixed with the usual pre-gentrification remnants and indeed holdouts. Transition in short. The restaurant is near the Berkeley/Oakland line, thus it's close enough to the heart of the City of Liberals to be a favourite of the Peace Corps crowd - those wanting to reminisce about a time when life had meaning, while maintaining the close ties to the soulful parts of the Oakland brethren and sistren - you know, those who keep it real. And then of course, there's your tribe of patrons: Africans in America. Ah nostalgia. It's a family affair. Her daughters and sons cook, serve and clean. On occasion the little grandchildren drop by. I think the word is cute. It's really like spending time in a family home, it doesn't feel like a Formal Restaurant™. You wouldn't come dressed in opera wear. It's not a dive, but it's suitably intimate, seven or eight tables, perhaps seating 25 inside, and a dozen out on the patio when the weather is right as it often is on this side of the San Francisco Bay. You get the red, gold and green painted exteriors, you get some batik prints. Was there a mask or two? Above all you get food from the Grandmotherland. Glorious Cameroonian cuisine is what you get. Ambiance and comfort are the fringe benefits. Ethnic food in the Bay Area is mostly Asian (Chinese, Korean, Indian, Indonesian) and obviously the ubiquitous Mexican. African food is represented by the numerous Ethiopian restaurants, their delicate civilization having a strong presence in these parts. Of course there's much more to African food and culture than Ethiopia and slowly that awareness is seeping into the public consciousness. We live near the Gourmet Ghetto in Berkeley, home to Chez Panisse and 15 or so restaurants. World-renowned, haute cuisine, Californian New World fusion cuisine with complicated ingredients - typical descriptions read like a Restoration Hardware label. You know what I mean: the expensive wines, the high snob quotient, the feel-privileged factor. Your mileage may vary but colour me unimpressed. When I need soul as I often do, living as we do in the midst of God's own people, I like to head out to our people, my people. I try to support the burgeoning West African community. There's Ghanaian Tropical Paradise down the street and, ever since I discovered it in the new year, there's A Taste of Africa. Thus you might find me there on certain lazy weekend afternoons, sporting my fresh haircut from the nearby barbershops (I have to cross over to the Oakland side of things to get the right hair treatment), sipping on a glass of their homemade ginger delight drink (the last time, I almost declaimed spontaneous poetry in appreciation), chatting with all and sundry, or perhaps quietly reading a novel as the whim might take me. I'll be there taking in the atmosphere, nodding to the music as the family get to work, conjuring up the meals. They chat amongst themselves with the back and forth and intimacy that comes from knowing. It's the easy familiarity of, well, a family. This is not fast food, it's homemade and unhurried, prepared with care. The menu is only a guideline, a starting point for a conversation. Ask for whatever is good that day. The menu alternates and Ma will cook whatever is her fancy. "What do you have today?" "Well... I think... today... well... you see... you might like...."
And so forth. The pauses and rhythms are eternal. The sense of time is African. You'll wait a while as the food is prepared. The sweet smell of the fried plantains, the sule as the Cameroonians call it, will gently waft in from the nearby kitchen tickling your sensibility. It's ten feet away; if you could you'd take a few leaps and pick up a few slices, hot off the fryer. But, well, you control yourself. As they say, good things come to those who wait. By the time the food arrives, you're ready. You dig in. What else is there to say? It's the main course, the main event, the main everything. I shall skip the ludicrous amount of pleasure you derive but I suppose I should describe the food somewhat. Let's start with the ndole. A sauce of peanuts, spinach, garlic, ginger and something special. Throw it on everything, you can't go wrong. I exchanged a look of delight with a grandchild, perhaps 4 years old, she knew the score about the ndole she was similarly wolfing down. The jollof rice is different from my customary Ghanaian fare, they don't seem to use long-grain rice, it's not the usual Basmati business, and the tomato treatment makes for a less intense taste. I like it though. Topped with Ndole, the fat lady sang. For the uninitiated, jollof is... well you can google it. Suffice to say that that it's my kind of thing. The sule, as I've suggested is great - again with a twist, I couldn't detect the ginger that would be in Ghanaian kelewele. The suya, well, that's something else altogether. The spice on the kebab is phenomenal. Cameroon's proximity to Nigeria comes in handy in this respect, the Nigerians have the greatest tradition of khebab. Suya. Suya. Suya! A chorus of approval. Try the pepper soup, typically with lamb or goat meat - or vegetarian if you must. Of course, this is West African food, so there's the obligatory fufu to accompany it (pounded yams in this case). There's more of course: moi moi or acara (various takes on black eyed peas), ewole which is the essence of Cameroon, egusi, okra and more. I'll let you discover for yourself. I was struck that everything was light; she cooks with a delicate touch. 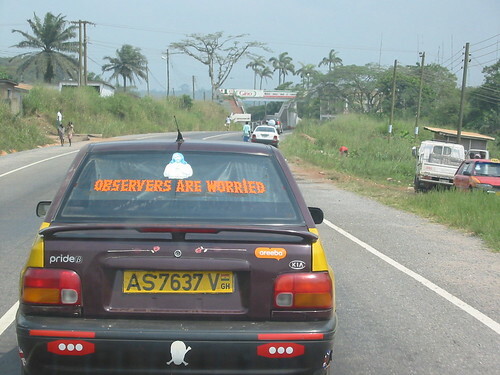 Some African restaurants go all out with heavy fare that the part of the clientele that are cab drivers appreciate. You will eat a lot here and you won't regret it. You are reminded that the beautiful people live in California. There's sensitivity to the market. Astute, I must say. Midway through your sustained attack on the delights at hand, she might take a walk around the place surveying the fruits of her labour. She doesn't need to ask; it's a done deal. But she does anyway. And yeah, she knows all right. She's seen it before: your appreciation is plainly evident from the precursors of sweat on your face, even before you launch into the obligatory mumbled 'it's ummm sooo ummm goo umm oood". She smiles. You smile. 6,000 miles away from the continent, diaspora, exile life is forgotten. For an hour of so, you're transported back home. You've gotten your taste of Africa. You're in the realm of the sated. A Taste of Africa is in Berkeley, California. Tell Ma I sent you. It's the least I could do. Tripoli. U.S. Deputy Secretary of State John Negroponte left Libya on Wednesday without meeting leader Muammar Gaddafi after becoming the highest-ranking U.S. official to visit the country in half a century, officials said. Negroponte said he held "excellent" discussions with Foreign Minister Mohammed Abdel-Rahman Shalgam and Ali Triki, Libya's envoy on Chad and Sudan, during a 24-hour visit aimed principally at discussing the crisis in Sudan's Darfur region. Dig: Gaddafi presumably refused to meet Negroponte because the esteemed cold warrior was involved in Ronald Reagan's attempt to kill him in the 1980s (the bombing ostensibly killed Gaddafi's adopted daughter amongst others). There is honor among rogues it seems, and there are still some lines that mustn't be crossed. As we have seen, "he tried to kill my dad" was cited as a motivating factor in the geo-politics of the past 6 years. It stands to reason that "he tried to kill me" would provoke scruples even among those not noted for possessing consciences. Tom Stoppard in Travesties imagined the scene in 1917 in the Zurich public library at the point where Vladimir Lenin, James Joyce (working on Ulysses) and Tristan Tzara (father of the Dada movement) might have run into each other. The result was inspiration itself. In this vein I imagine Gaddafi, Omar Al-Bashir of Sudan, and Negroponte all in the same room. You might think that it is unfair to place Negroponte in such exalted company since he's an enforcer and not an idea man; a mere civil servant and career diplomat. He's just doing his job after all, scion of John Foster Dulles. And yes, it would be unfair, not to mention a case of "insinuendo" as it were. And a matter of blood. Still, Negroponte floating the "El Salvador option" in Iraq in recent years was iconic, and his statements were followed in the ensuing months by, well lets put it this way, a plethora of death squads dumping dead bodies at night with gruesome efficiency in the streets of that sad country. I'm reminded that General "Gitmo" Miller's visit to Iraq and emphasis on Gitmo-izing things obviously had nothing to do with all that Abu Ghraib hullabaloo that also followed. Several Pentagon investigations affirm that insight, right? There's no proven connection. It's all shades of gray when the gloves come off. Necessary exoneration. One wonders what happens when these lords of war get together. Oh to be a fly on the wall of such encounters. Imagine: the architect of the CIA in El Salvador meeting with the architect of almost every malfeasance in the Middle East and Africa for a good generation. The Good Shepherd meets El Capo, rogue division. Death squads in Latin America meet death squads in West Africa. On Monday: mighty masters of macabre mayhem. The high priests of collateral damage tangle in the desert. Live exclusively on pay-per-view. The Great Game. Further one wonders: are they truly ideologues? At what point does collateral damage itself become the prime motivation for their misdeeds? What ultimately separates these guys from the blood lust of Ayman al-Zawari and company? There is a difference to be sure. But is it simply style or rhetoric? The panache or subtlety with which they dispatch enemies, real and imagined? For indeed, even at a remove and intentions notwithstanding, their body counts are impressive. And could one even shed a micro-tear for a millisecond for al-Bashir? Good Lord, you prompted Negroponte to seek out Gaddafi, the first high level meeting in decades. What world class malfeasance must you be orchestrating in Darfur? Carnage of champions. Hell froze over. The enemy of my enemy and all that. The rough beast. The following is a rush transcript of the secret meeting held between John Negroponte and Muammar Gaddafi in Libya on Wednesday April 18, 2007. The videotape was leaked to the toli and was immediately handed over to the relevant authorities for authentication. All transcription errors are mine. Gaddafi: Brother Leader of the Great Socialist Arab People's Jamahiriya. Negroponte [impressed, but not wanting to show it. ]: Skull and Bones... [Low steady voice] Death squads in Honduras. Gaddafi: Death squads in Liberia. Negroponte: Massacres in El Salvador. Gaddafi: Small boy units. Charles Taylor. 'Nuff said. Gaddafi: Sierra Leonean amputations. Heard about Foday Sankoh? Trained a few miles from here. Negroponte: Special intelligence units, Nicaragua..
Gaddafi: Semtex for the IRA. Provisional and Real IRA. Training camps. Negroponte: Weapons for Savimbi. Hosting Unita via Mobutu. Heck: Mobutu. The fat lady sang. Gaddafi [absentmindedly]: Those Basque separatists... um... what's their name, again? Negroponte: The El Salvador Option. Iraq. The latest. Militias. Pershmerga. Shia. 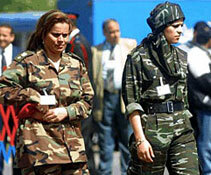 Badr corps. Gaddafi: Propped up Idi Amin. Negroponte [whistles]: Ancient history... Death squads in Guatemala. 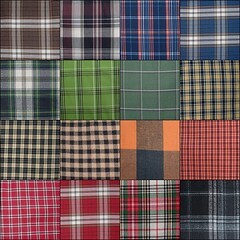 Gaddafi: A pattern. Let's see: Jammeh in Gambia, even gave him a medal. Negroponte [air quotes]: "Dedication to democracy". Negroponte [smiles broadly]: Nicaragua. Iran/Contra baby. Negroponte: Old school... Hmm. School of the Americas. Gaddafi: Rawlings... Campaore in Burkina Faso. Negroponte: Small fry. New school. Black ops. Extraordinary rendition. Gaddafi: No. No. Beat this: Carlos the Jackal. Negroponte [a brief pause for reflection, then triumphant]: Pinochet! Negroponte [curious]: So... was Black September one of your... affairs? Gaddafi [wagging his finger]: No. No. Room and board only... Abu Nidal. That guy, now there was a wild one... Black September. Black ops... Let me ask: Abu Ghraib? Negroponte [quickly]: Rumsfeld, Cambone, Miller. Axis of- [cuts himself off]... Mugabe? Gaddafi [shaking head]: Nope, strictly business with Bob. Mining interests. Negroponte: Yes, yes. We also have interests. The United States only has interests. Negroponte: Our hands are clean. Negroponte [nonplussed]: Women from Honduran villages. Just ask Wilkes. Congressmen, agents. They all want more. Gaddafi [suppresses a look of admiration... then]: Back to business. Negroponte [shocked, then recovers, coldly]: Your daughter. Clean hands... That will do. Negroponte [nods]: You refused. We never met. Negroponte : We never met. Negroponte [to subalterns]: I think we can do business. Negroponte: A good meeting. Excellent. Excellent discussions. Strange bedfellows are among my favourite subjects. Consider this note part of an occasional series. The banner is Fallen Angels. Item: Stevie Wonder records Happy Birthday on his 1980 album, Hotter Than July, to lobby for a public holiday for Martin Luther King, Jr.. In 1980, when Ronald Reagan won the White House, conservative ideas appealed to many, even most, Americans. At the time, we were truly a middle-class nation. To white voters, at least, the vast inequalities and social injustices of the past, which were what originally gave liberalism its appeal, seemed like ancient history. Would history repeat itself, one wondered? Let's pursue an alternate history, if you will. After the maudlin Ebony and Ivory (1982) with Sir Paul, there was a slight pause. Then: Stevie Wonder releases Skeletons from his Characters album in 1987, raising his voice about the South African situation. Effect? : The apartheid government of South Africa begins secret negotiations with Nelson Mandela and company in 1988. Mandela is released two years later and becomes president of the country after the ANC wins the 1994 elections. I fought for civil rights and all I got was a lousy holiday. Move on, it's all ancient history. Jacob Weisberg's writing represents the just before banal of the center left in the United States. This is not to say that Mr. Weisberg is stupid, merely that by the time he writes something, there is a vast "The End" spray painted on the wall. He says something just as it is about to become common knowledge. Dig: Barely weeks later, Joe Klein declared George W. Bush unfit to lead. Per Newberry's spectrum of banality, Klein should be counted as being merely banal. One awaits the post-banal. Only posterity is unkind to the man of conventional wisdom, and all posterity does is bury him in a blanket of neglect. I've been working for the past 18 months in the "emerging web technologies" group at IBM. When I first joined, I was struck by a certain difference in attitude compared to my previous experiences at Lotus. "Eh? ", I'd almost hear my colleagues say silently whenever I'd start discussing the merits of any technology. When they responded, there'd be a quite jaundiced sound in their voices. You'd notice the slightly arched eyebrow and perhaps a tightening of the mouth. It wasn't quite incredulity but it was fairly close to wariness. I speculated that this tendency was born of years evaluating countless Next Big Things and was simply the posture of experts and futurologists: "What are you selling this time? Tell me something new...". They've seen standards come and go and the various fashions that sweep the technology world. The group is a little guerrilla outpost of pragmatism, if you will, within Big Blue. I am fairly cynical about buzzwords and the mechanics of technology adoption, but even my experiences of the Lotus side of things hadn't made me that skeptical. In any case I mention this because I was recently merrily surfing away and came upon the following bullet item in a laundry list of proposed features for Java Server Faces (JSF) 2.0. Quite simply I caught myself saying "Eh? Eh!". My normally sedate eyebrows even arched violently. I couldn't help it. I haven't closely followed the technology known as JSF, but I think if you wanted to quickly evaluate its prospects as an 'emerging web technology', you could do well to simply dwell on what I've highlighted. Its history, its rate of adoption, its maturity and perhaps even its future prospects are fully encapsulated in that most remarkable passage. It is striking that it is only in its fifth year of existence that a framework for building web applications is considering allowing bookmarking and might even use the HTTP GET method where applicable. How can one possibly develop successfully for the web without identifying important resources? That is the first plank of the REST elevator pitch. If you can't bookmark, if you can't cache, if you are invisible to intermediaries, you are willfully ignoring the web. Technology toli readers might remember an intervention and case study on internalizing the REST style that focused on much the same aspect in the case of WebSphere Portal and its first 3 years of existence. The benefits that I outlined once the portal embraced the web are much the same that will accrue to JSF. Ed Burns and company seem to have staged a REST intervention on JSF. Head nods to them. My first encounter with JSF was when it was announced at JavaOne in 2002. The name seemed funny ("faces" instead of interfaces?) but I'd seen worse. My snap judgement: yet another framework for building web interfaces, oh well, the more competition the better, we'll see how it pans out. I note that I've only mentioned JSF once: outlining how its abstractions leaked mightily when it came to html buttons and forms. Three years ago, we had been forced to use it in our forms work because it was deemed "strategic" in the IBM Software Group. I didn't have the clout to affect the decision and, well, I worked to get something to ship to customers. Inwardly however I discounted that project's prospects of success based on my experience with the first releases of JSF. A demo that looks good will get you in the door; an application that works well will actually get deployed and used by Real People™. In the same piece, I referenced the reaction to the release of Google Web Accelerator and the way it highlighted the large number of web frameworks that were ignoring the basic principles of the web architecture. It seems that those frameworks that were deployed on the broad web and whose flaws were publicly exposed in that episode took that lesson to heart. Their creators have begun internalizing the web style to its core. To take an obvious example, the latest releases of Ruby on Rails seem to be almost religious in the fervour for the gospel of REST. I suspect that JSF wasn't widely deployed outside of 'enterprises' two years ago hence the outcry that many other frameworks faced to "fix your damn code" wasn't heard. It appears that the message has since been conveyed and that fateful item speaks volumes. REST it is. Sun is going full bore towards embracing the web. And about time too. I have described REST, the web style, as being laissez faire distributed computing. This is a blessing in that its laissez faire approach has the virtue of encouraging participation by as many people as possible. Indeed its embodiment in HTTP might be one of the most successful cases of technology adoption we have seen. To pursue an argument by analogy on the other hand, I'll note that markets regularly fail. There are the temptations of monopolies seeking rents and that the economics of affluence and attention apply. There are bad faith actors, and you need to create spaces for market lubricants: price discrimination, market makers, arbitrage etc. Income inequality, trickle down economics are widely seen when we fetishize all things laissez faire. Still, there is almost no market which is fully laissez faire; we have laws and regulations even in the freest of markets. There's no coercion in these suggestions. REST is all carrot and no stick. Now the thing is that once you've imbibed the web style and embraced its minimal restrictions, you don't look back and all those externalities begin to accrue. Based on the urgency of that bullet point, I am fully confident that the next few releases of JSF will be bonafide Next Big Things ®. Most of us had to crawl before we walked, or fall off the bike a few times before we learned how to ride. I only wish that certain technologies would fail faster or at least blunt their noses earlier. Contact with a mass audience on the web seems to be essential in this respect and this presents a dilemma. Big companies have credibility by virtue of heft and inertia when it comes to purchasing decisions - the technologies they promote get in the door almost by default. Those who sell to big companies also know that, so long as they make the right noises about the strategic direction they are going in, they will get the benefit of the doubt. I would argue that this is only true in times of affluence. When we are all minding our purses, we look more closely at these things and will use what is expedient. Contrast the spread of web native applications like wikis to vertically integrated teamrooms and content management systems. Moreover, the web radically levels the playing field. In the decade or more since the web was adopted as the preferred platform, we have witnessed an inversion of emphasis due to its vastly wider audience and scale. I'm reminded of the words of a fellow traveller. I suppose I'd call myself a pragmatist. I do whatever works. I strive to fail faster. It's the results that matter, and simplicity (stripping layers) is celebrated because time is precious. We don't have time to waste on complexity and buzzwords; we're already behind on inventing the future. Waiting 5 years before you adopt the native architecture of the web is almost inexcusable. The web won't (and didn't) wait that long. Others will route around you and their dynamism will be adopted by the marketplace. Now it's a game of catch up on that elusive thing known as mindshare and ultimately on cold cash, rueing all those missed opportunities. The perplexing challenge of the web remains: how do we encourage things to fail faster? Perhaps we should all learn to say "Eh?" more often. The humourous message of this song from The Pharcyde's hugely influential debut album is that obsolescence awaits if opportunities go wanting. The chorus is wist itself: "she keeps on passing me by". Fun soul music that made the pop charts: "everybody walk the dinosaur". It appears that the web style is exploding things at Sun and other big companies. 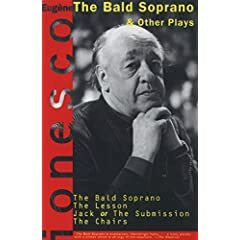 It is only fitting that we end with a swinging track from the essence of swing, the big band at its tightest, the horns, the driving bass, not to mention the Count's percussive piano, provide the counterpoint to the ironic serenade of the sleepwalker. 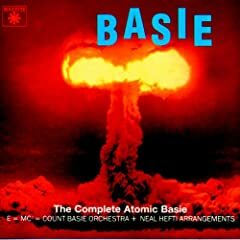 The album title: The Complete Atomic Basie. Eh! Let's have a look at some pop art to continue the Things Fall Apart series, this time an entry in the Comfort Suite. In considering the various responses to the themes of my ongoing series, I've been wondering what helps keep things together even when there is much cause for despair. Culture and art are the standard answers it seems. Another partial (if obvious) explanation in Africa is religion, and consequently the topic of this note is articles of faith. 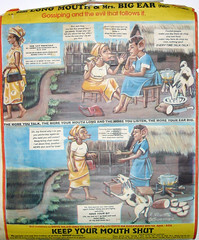 My entry point to the discussion will be a few Nigerian calendar posters that The Wife bought in Northern Ghana in 1999. Christianity and Islam are among the visible competitors in the cultural and political marketplaces of Africa and are no strangers to advocacy for our souls. Thus I direct your attention to a photoset: Articles of Faith. The artist is a certain R. Nkwonta of CAS Creation; God's Providence Printers of Mushin, Lagos are the publishers. 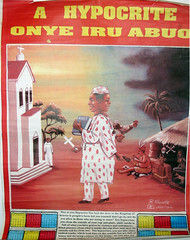 Posters and sign art of this sort are quite popular throughout West Africa. Nkwonta's are among the most distinctive I've seen. Religion and various social mores are his favoured topics and they are tackled with aplomb. We are in the realm of pop art and agitprop - guerrilla marketing, in short, in the service of the Good Lord. Of late, there has been the move to digital presses but the motifs of traditional sign drawing have been preserved in these handpainted posters. 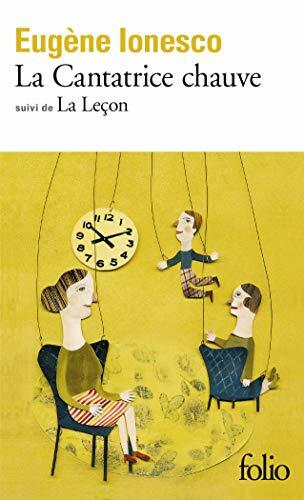 The graphic style might be labeled folk art by ethnographers, or crude or primitive to certain eyes, indeed the strokes are broad and exaggerated. 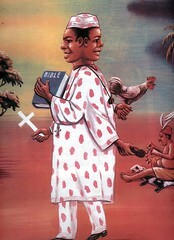 Much like traditional African theatre, or say the newfangled Nollywood movies, realism is beside the point. Rather it is all about the message, this is engaged art. But less prose, let's start, if you will, with the downfall of Satan. 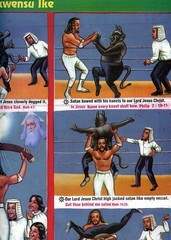 The story recounted in this poster is "The Glorious Victory" of Jesus over Satan in a hard fought wrestling match. It is worth paying attention to the panels of this low brow tale of angels and demons; a close reading is revelatory. Our Lord Jesus Christ is ready to high jack Satan. Satan makes first attempt but Jesus cleverly dodged it. English is not the author's first language but we'll admit that the malapropisms are inspired: "dogged" is a good stand-in for "dodged" since the horned Satan is behaving like a vicious dog after all - not to mention his attire. The "high jack" spinebuster is an apt counterpoint to the "down fall" of the poster's title. Presumably God, as the Supreme Justice, is the wigged-out referee in this wrestling bout. Also note that Jesus's tattoo, with the "Gilly Mercy" inscription, seems to shift position, from arm to back to chest, once again proving that the Lord works in mysterious ways. I hope one of my Nigerian friends can step in with a translation for Gilly (it is igbo right?). The fight is on and a curious dance seems to take place. It's not quite a foxtrot it's more like a capoeira. 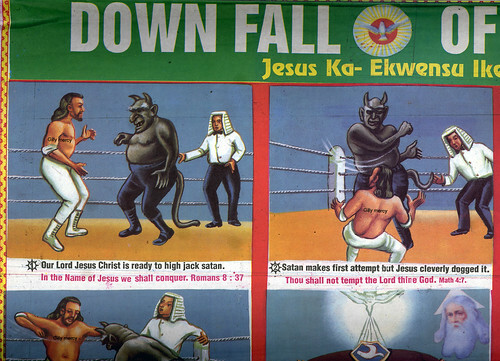 Nkwonta later explains that "Satan bowed with his knees to our Lord Jesus Christ". This is only fitting and we can treat the horned beast like the "empty vessel" he is. 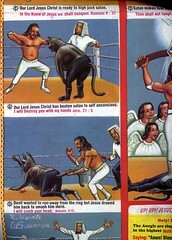 Soon enough we get to heart of the matter namely: "Our Lord Jesus Christ has beaten Satan to self unconscious". This is accompanied by Jeremiah's prophetic warning that "I will destroy you with my hands". My sunday school days of yore aren't too distant hence I would hazard that this verse refers to God admonishing Adam, Eve and the serpent. 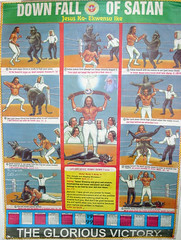 Wrestling is a big tradition in certain parts of Nigeria. Nkwonta is undoubtedly a wrestling aficionado as are his protagonists who know all the high jacks and other sundry moves. 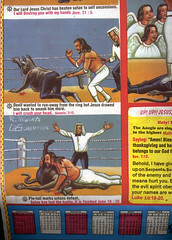 We can only marvel at the technique displayed as "Jesus turned the devil upside down in order to destroy him". Thus we see that a "pin fall marks Satan's defeat" and, finally Of course, Jesus is declared the winner. "Up! Up!! Jesus, Down! Down!! Satan" is the ultimate message. 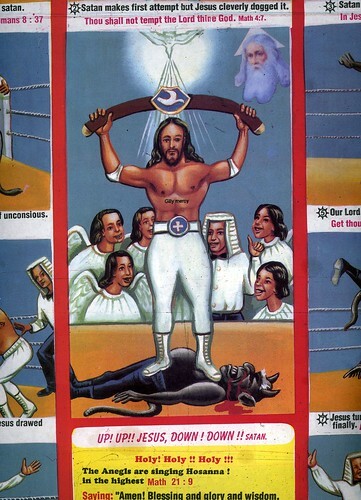 As the spirit descends in the form of a dove, Jesus, his six-pack abs rippling, holds his title belt aloft and delicately steps on the bleeding (and presumably permanently dealt-with threat from the perfidious Satan). Stepping on someone is about the most humiliating thing one can do; one can't understate the impact of the image is a society where respect and honour is paramount. All the time the angels smile and sing hosannas. My initial theory about God being the referee is proven mistaken, the bewigged referee is clearly part of the throng of angels. God is rather the spectral and enigmatic figure in the top right corner. The tropes of religious iconography have been duly satisfied. We continue our discussion with a poster illustrating the ongoing competition for the soul of the African man. No words are minced in the case of a hypocrite. The overt purpose of this exhortation is the shaming of hypocrites: those who, on the one hand, take up the the cross and bible and, the next day, turn to 'darker' matters shall we say. This is of course is often framed as a matter of tradition and modernity. There is much gnashing of the teeth in these areas and it is not just in matters of religion that this contest takes place. 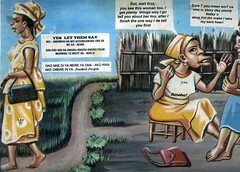 As an example, doctors in contemporary Africa steeped in the expensive western medical tradition often have to worry about their patients visiting traditional healers (typically dismissed as fetish priests and the like). In that case there is very real concern about the interaction of the drug regimes with herbal remedies and the plant impurities often found in them. After heading to Church one day the hypocrite turns to worshiping of idols the next. Note the dark clouds forebodingly pregnant with tropical rain and worse. The chicken (or rather the fowl) to be slaughtered is at hand. The skull and bones, the dead animals, the bare-breasted woman in the shrine, this is the heart of darkness one might say. 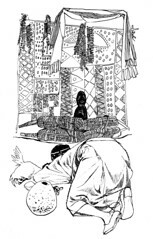 This is the popular conception of fetishes, juju, voodoo and traditional African religions. It is to be dismissed as superstition as testified to here by the clay or wood idolatry of the mask. According to the Pastor, though this year 2007 biblically was a year of double blessings, any mischievous politician or reverend minister who intended taking undue advantage of his/her position to exploit the people especially the poor and less privileged was in for "double curses". The accompanying image picked by the Ghanaweb editor to illustrate the devil is all pointy extremities as one might expect. the oath involved holding a Bible in the left hand and a handful of earth in the right hand pressed to the navel while swearing to serve the Kikuyu people faithfully.... [In the 1950s] the meat of a goat replaced the Bible... White farmers reported a mood of increasing truculence and incidents of cattle-maiming and sabotage. Back in Nigeria, Rems Nna Umeasiegbu spent a decade respectfully documenting Igbo traditions, customs and stories that appeared to be disappearing and published his findings in his 1966 book The Way We Lived. 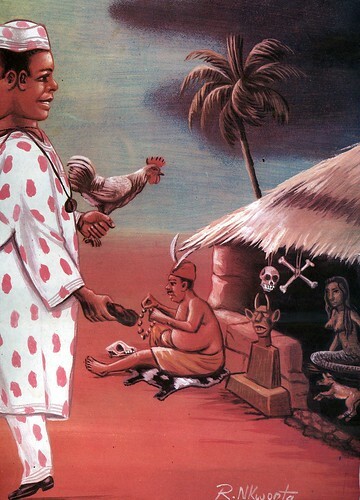 His illustration of a juju ceremony is in the same vein although perhaps a few minutes later than Nkwonta pictured it. The missionaries and colonists faced this intractable problem and the churches that were their legacy are still combating it and even apparently with greater fervour. Some missionaries who have served overseas have unhappy recollections of trusted converts reverting, on certain occasions, to 'pagan' beliefs and practices. The experience was all the more stunning when the converts concerned were not the more recent ones, but Christians of long standing, sometimes with fine records of conspicuous service and loyalty. The problem takes on a new dimension when it is presented as part of the general problem of the encounter between Christianity and indigenous cultures. He suggested a reversal of the typical context and advocated that the burden should be on the church to present itself as relevant to the local belief systems. In this vein, the art must reflect those themes - if only to subvert them; I suspect that Nkwonta is on board. 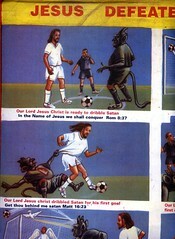 A living religion must strive to be relevant to its practitioner's lives and interests hence we return to the sports motif with a football match between Jesus and Satan. 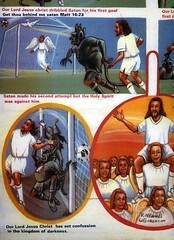 Despite the dastardly foul early in the game, Jesus dribbles past Satan for his first goal. As Matthew put it in his gospel "Get thou behind me Satan". A lot of fun was had in these panels and with economy in the illustrations. Observe the Angel flying to the right of the goal post to block Satan's first attempt with an athletic catch - Petr Cech would be proud. 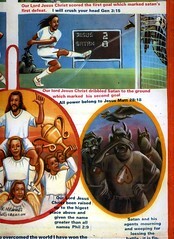 To punctuate Jesus Christ's first goal we return to that potent scripture quote: the crushed head business. Others translate it as "strike your head", regardless, trash talk doesn't get more direct. Satan then makes his second attempt but the Holy Spirit was against him. The dove, embodying the spirit, diverts his attempt and the angel goalie, who had reacted tardily and would not have made the catch, skips happily, content at not having to make a difficult save. It pays to have friends in high places. 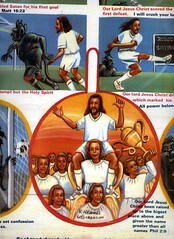 Note, later on, that Jesus heads the ball over the hapless defenders of evil. Evidently: "our Lord Jesus Christ has set confusion in the kingdom of darkness". Again the style displayed is akin to that of the writers of the New Testament gospels who strove in their depiction of Jesus's acts to underline the fulfilment of prophecies with pointers to passages in the Torah. 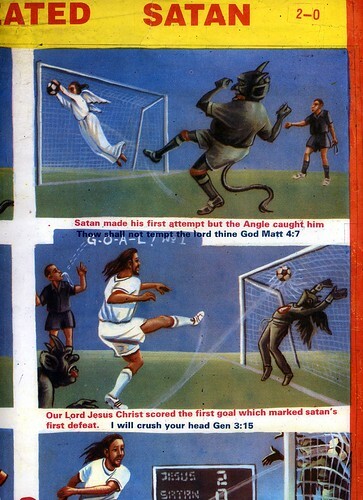 Interestingly enough there is a third goal depicted "when the Lord dribbled Satan to the ground which marked his second goal". 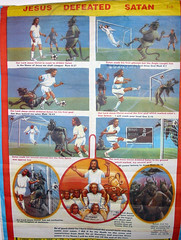 Given that the final score (in smaller print at the top right of the poster) is 2-0 for Jesus, it must mean that the header of the other panel was disallowed by the referee. Alternatively this discrepancy might be a reference to the eternal mystery of the Holy Trinity in Church doctrine. Catechists beware. As one would expect, a victory celebration marks the end of the match. There is much that can be asked about these posters but we'll keep our exegesis brief. Do note, for what it's worth, that all the angels seem to be women. I won't dive too deeply into this female subtext (The Magdalene Propositions); I'll only note that the issue of female clergy and ordination of such is currently rending the Anglican and Episcopal churches apart (along with the stance on homosexuality). Similarly I'll pass over the issue of the ethnicity of Jesus. Is he simply very tanned? And what about the nappy hair? Are those dreadlocks or just your typical semitic features? The tattoo tradition? Is this simply artistic licence in the pursuit of audience empathy or is a more subversive reading warranted? Overt religion is not the only mode that Nkwonta works in; social mores and behaviour fall under his purview - his is a complete worldview. 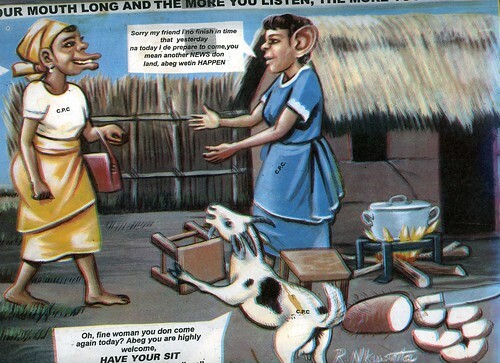 Thus we turn to the case of Madam Long Mouth and Mrs Big Ear. This poster is more in the vein of social commentary than religious admonition. He presents a typical morality play aimed at an audience who have recently left their rural abodes. 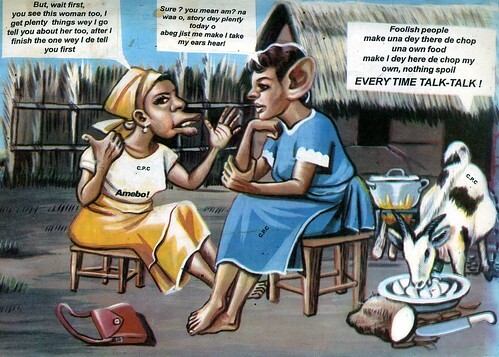 The subject is "gossiping and the evil that follows it". The object of her neighbour's gossip is saintly and minds her own business. "Yes let them say", she mutters to herself as she heads off to her good works. As for the neigbours, suffice to say that "every time talk talk". Long Mouth and Big Ear chat unconcernedly, neglecting their household duties, while the goat takes advantage to eat the yam from their plate. Abeg you are highly welcome. Have your sit [sic]. The subtext is clear: "The more you talk, the more your mouth long, and the more you listen, the more your ear big." The lesson is to "keep your mouth shut", your food and more will go to waste. Nkwonta's versatility with the poster motif has been rightly picked up by a few ethnology publications. Social anthropologists would have a field day studying his full body of work. Take for example his poster of The First Lady Wine Tapper. Social uplift is his message. Elsewhere, and less successful artistically, similar painted movie posters have been exhibited. 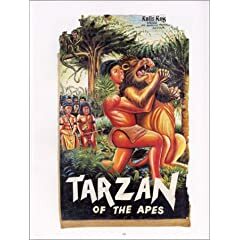 In those cases, instead of social commentary or religiousity, it is in service of lurid commericalism as in Extreme Canvas: Movie Poster Paintings from Ghana. To my eye those don't attain the heights I've shown here. Nigeria, like many other countries in Africa, has been struggling to regain confidence after several lost decades. Along with the millennial implications of 1999, Nigeria was then just emerging from the suffocation of the Abacha years - waiting for an angel as it were. One coping mechanism for the years of arbitrary misrule and hardship was a turn towards these new Christianities. In a matter of a few decades, these currents are now asserting themselves prominently in the zeitgeist. You may think the sentiment here is cartoonish, or dismiss it as crude, that it could only work in developing countries where audiences are cupid. I believe that the appeal is rather in their ingenuous charm. You know where you stand when confronted with this kind of rhetoric as opposed to some of the sophisticates we see in the West that are neither here nor there. 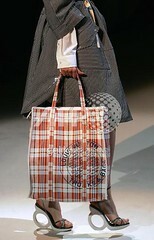 Perhaps a certain simplicity has mass appeal in these troubled times. 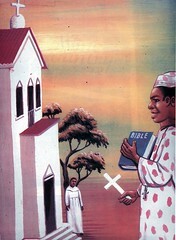 The spread of charismatic churches has been noted in Africa. Evangelicals and baptists are on the rise everywhere. In the US currently the arguments are over conservatism, Darwin's God, atheism and the like. The new Pope, per contra, thinks we should talk more about hell these days. Milton in Paradise Lost didn't shirk from this notion and indeed dove in with the definitive account. We often dismiss the opium of the masses as dangerous, doctrinaire and simple-minded. Yet there is considerable humour when presented with this kind of whimsy. The themes are expansive, appealing and direct. The hard knock life is a staple of the Great Game. We are starved for meaning and religious types and their printing presses are quick to fill those gaps and "educate" our souls. One needs to get down and dirty to compete in the marketplace of ideas. Hilarity is a weapon of choice. Nkwonta seems to have fully internalized those beliefs; his creations are testament to ground level pragmatism. Springing from the trenches, he produces his tokens one panel at a time, bite-sized gestures towards a certain spirituality. This is a complex piece of advocacy, an expression displayed without artifice. Low brow it may be but this is art in full, and effective at that. You certainly can't be indifferent to these articles of faith. The alternative of course is the black magic of the wonderful Higher Ground from the Innervisions album. Dense, tense and full of turmoil, this is the music of conflicted souls. It features Wayne Shorter's virtuoso saxophone pouncing from the dark on Elvin Jones drums and McCoy Tyner's piano. Sunny Ade's laidback juju music continues to be a touchstone in West Africa. It is a conversation that calls out to listeners to participate. There are no boundaries between the musicians and the audience. 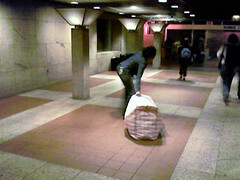 Fodder for those late nights in urban spots, seductive sounds for all night comfort suites.